Local bestseller “Hillbilly Elegy” reflects on a blue-collar Kentucky childhood. J.D. Vance was born into love, abuse and decline. A hillbilly with Kentucky roots, he survived a drug-addicted mother, gun-packing relatives and a culture of defiance and self-doubt that coalesced into a political voice that has made Donald Trump an odd savior for a swath of white, working-class America. 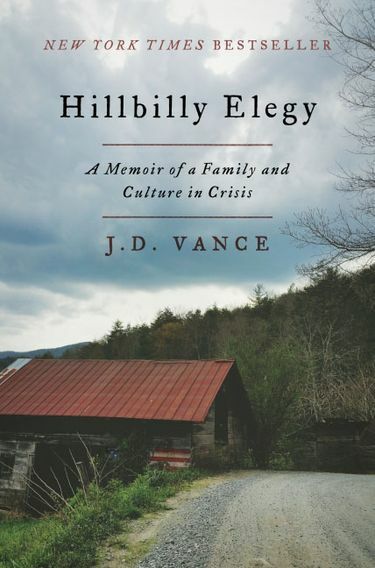 Vance’s unapologetic autobiography, “Hillbilly Elegy: A Memoir of a Family and Culture in Crisis,” is a poem to the hills and hollers of his childhood where a blue-collar sentiment often blames government and big business for poverty, addiction, violence and families in disarray. The book echoes with an insider’s righteousness of a boy — weaned on the cursing and strength of his Mamaw — who grows up to reject that defeatist mind-set by enlisting in the Marines and graduating from Yale Law School. “Hillbilly Elegy” is a white man’s take on a culture that is at once stereotyped and mythologized. If read alongside Ta-Nehisi Coates’ “Between the World and Me,” a black father’s profound meditation on the racism that may engulf his son, the two would present portraits of the most bitter and volatile forces at play in America today. Vance emerges as a conservative who disdains right-wing “conspiracy mongers” and “fringe lunatics” who have tainted politics with a divisive pessimism over the diminishment of the American dream. Wall Street, wage stagnation, foreign competition and the closing of mines and mills have gutted Appalachia and the Rust Belt. But Vance worries that the hard work and self-reliance that were the creed of that dream have succumbed to welfare, crime, addictions and broken communities. “President Obama came on the scene right as so many people in my community began to believe that the modern American meritocracy was not built for them,” Vance writes. “We know we’re not doing well. We see it every day: in the obituaries for teenage kids that conspicuously omit the cause of death (reading between the lines: overdose), in the deadbeats we watch our daughters waste their time with. Hardly insights you’d hear at a Trump rally. Trump, whose father gave him a fortune, and Vance, whose father gave him up for adoption, are speaking of the same audiences but with opposing messages. Trump peddles mistrust and a belief that the white working class has been decimated by a liberal government whose trade, immigration and environmental policies killed jobs in the coal fields and shipped other work overseas. The presidential candidate’s bluster is much keener on projection than introspection. Vance accepts that the blue-collar world has been jolted by many of the same factors. His prescriptions, however, are harder to hear and often push the blame back on individuals. His lessons can appear preachy and simplistic. The memoir would have benefited from a bit more history of how the timber and coal industries — economic saviors that often ran on duplicity — dominated an Appalachia isolated by geography and tradition. Mechanization and the decline of coal forced significant migrations from the region, but many who left yearned for their hollers. Perhaps nowhere else in America does the land figure so prominently in the soul. That reverence struck me often in the early 1990s when, as a national newspaper correspondent, I traveled the back roads of Appalachia. Young people were heading for textile and furniture mills in North Carolina or construction jobs in Georgia. Many who stayed turned to handouts and prescription drug abuse. It was a land in torment, but also a world of unadorned poetry, where a man “as old as God’s dog” could sit on a porch and tell you that snow blew hard and pure beyond the coal tipple. It was a cruel paradox. For all its natural riches, the region, rugged and hard to develop, could not provide for those who loved it. That reality was made starker by underfunded schools and a lack of retraining programs. Men felt torn and unprepared, willing to reinvent but not knowing what to do when coal company tools were wrested from their hands. Pride was bundled with the land, and many felt insecure wandering past their mountain borders. Vance’s grandparents — Mamaw and Papaw — undertook their own odyssey after World War II. They followed the “hillbilly highway” north from Jackson, Ky., to the factories of Middletown, Ohio. Vance was born in 1984 and raised in Middletown. His mother, a nurse, stressed education for her son but was troubled by drug addiction and a parade of lovers. So was Middletown. Both were degraded by poverty and consuming anger. Disdain of Washington and Wall Street grew white hot. An overweight, underachieving-student burdened with doubt, Vance, who knew little of the outside world, enlisted in the Marines and served in Iraq after high school, escaping the fate of family and friends. They are questions Trump never faced.